On March 21st, Ken Gresham, Senior VP Program Development, Mississippi Drug Card, presented a check to Batson Children’s Hospital. Kathryne Lewis, Events Coordinator, was pleased to receive the check donation in the amount of $3,140.35. After the presentation, Ken was given a tour of the hospital. 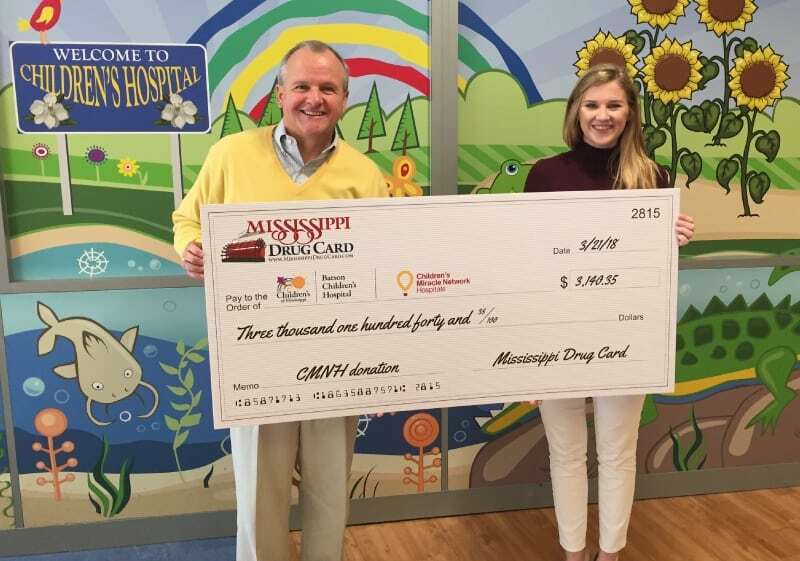 The partnership between Batson Children’s Hospital and Mississippi Drug Card helps create awareness for the Rx savings program and helps raise money for the hospital at the same time. A donation will be made to Batson Children’s Hospital each time a prescription is processed through Mississippi Drug Card. We are excited to be a supporter of Batson Children’s Hospital and all the patients they help. Since 2015, the United Networks of America partnership with Children’s Miracle Network Hospitals has raised over $2.4 million dollars for local children’s hospitals. Of this, $3,140.35 has been raised for Batson Children’s Hospital. Batson Children’s Hospital is the flagship of Children’s of Mississippi, part of the University of Mississippi Medical Center (UMMC). As Mississippi’s only children’s hospital, we care for kids from across the state, offering everything from emergency care to highly specialized heart and cancer care for kids. Batson Children’s Hospital treats about 150,000 children each year in more than 30 specialty areas, including newborn medicine, pediatric cardiology, neurology, and surgery. It houses the state’s only pediatric intensive care unit and emergency department along with Mississippi’s only pediatric treatment programs for cancer, cystic fibrosis, sickle cell anemia, congenital heart defects, and more.